Seegene said today it will enter the U.S. diagnostic market by partnering its Allplex™ assay with Thermo Fisher Scientific’s PCR System—a combination the South Korean MDx developer said would create a comprehensive molecular diagnostics solution. The companies have entered into a strategic collaboration whose value was not disclosed. Seegene said it plans to file for FDA clearance of its Allplex diagnostic assay portfolio at the same time that Thermo Fisher files for FDA clearance to run Seegene's assays on Thermo Fisher's QuantStudio™ 5 Real-Time PCR System. Seegene aims to submit an application for 510(k) clearance by the end of 2018. “We are proud to collaborate with Seegene as we move forward to seek FDA clearance for our respective platforms in parallel,” Kim Kelderman, vp and general manager of genetic analysis at Thermo Fisher Scientific, said in a statement. Seegene focuses on developing and marketing its high multiplex molecular diagnostic assays, which use its proprietary real-time PCR technologies. Allplex’s capabilities include providing Ct values for multiple targets in a single tube or well. Seegene reasons that its multiplex detection technologies will gain a foothold in the U.S. by being coupled with Thermo Fisher's instruments. The first rollout of diagnostic in the U.S., Seegene said, will be its collection of multiplex one-step real-time RT-PCR assays focused on sexually transmitted infection (STI), gastrointestinal, and respiratory pathogen detection—part of the company’s portfolio of syndromic panel products envisioned to enable precision testing. 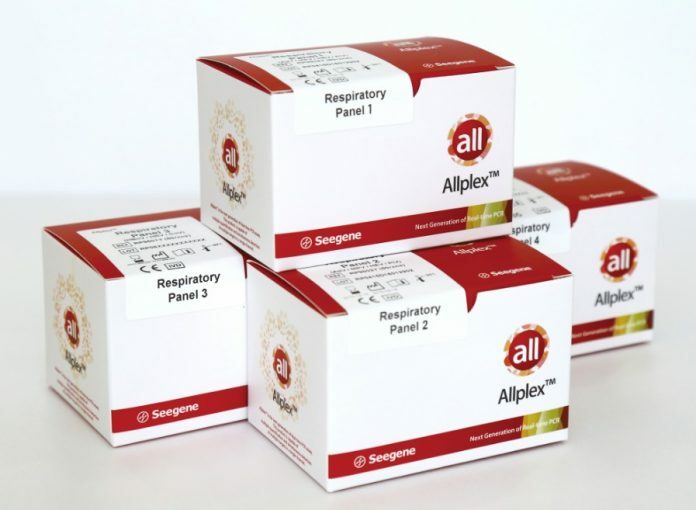 Seegene’s Allplex respiratory panel assay, consisting of four different panels, is designed to detect and identify 16 viruses, seven bacteria and three Flu A subtypes in patient’s specimens. Allplex gastrointestinal panel assay is intended to detect and identify 25 GI pathogens including six viruses, 13 bacteria and six parasites simultaneously. Allplex’s STI/BV [bacterial vaginosis] panel assays are designed to detect and identify 28 pathogens—4 viruses, 16 bacteria, 1 parasite and 7 candida spp.—related to sexually transmitted infections, as well as provide multiple quantification information of targets using individual Ct value in a single channel. “The synergistic combination of Thermo Fisher's newest instrument and Seegene's powerful multiplex PCR chemistry technologies will enable us to gain U.S. market share by offering advanced detection methods to more physicians and patients,” added Seegene CEO Jong-Yoon Chun, Ph.D.